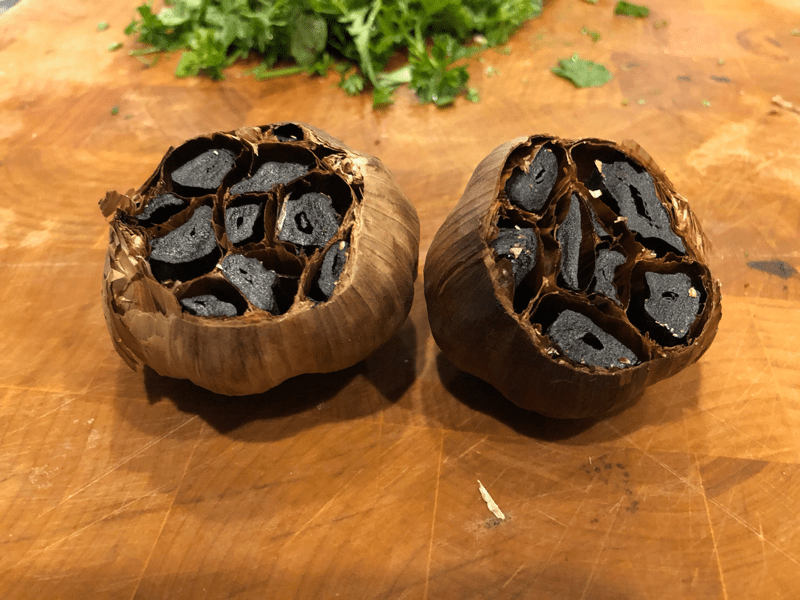 I recently joined a foodie group that was ALL about the Black Garlic. I was lucky enough to have someone loan me a fermenter so I could make my own black garlic. If you haven’t tried this – it’s definitely an exotic treat. It’s basically garlic that has been fermented for 12 days or so. There are a bunch of different methods for doing it and it can take as long as 30 days to make. The result is a chewy, sticky ,nutty tasting, slightly sweet , almost pungent garlic that doesn’t stink as much as regular garlic. It’s also not nearly as acidic as regular garlic. I’ve been experimenting with it – and I definitely like the taste. So far I’ve made a black garlic pasta and also used it as a paste for a steak for seasoning. I’ll be posting more about things I make with this. It’s really sticky so it’s not the easiest thing to mince.